Ben Kruidbos said he was concerned that attorneys did not have all the information they needed to prepare the case. 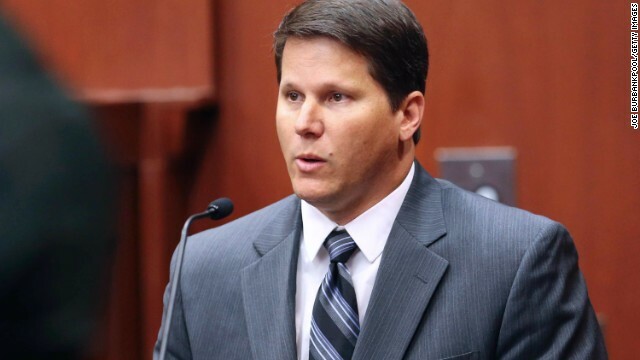 Sanford, Florida (CNN) — An employee of the Florida State Attorney's Office who testified that prosecutors withheld evidence from George Zimmerman's defense team has been fired. Ben Kruidbos had been on paid administrative leave since May 28 from his job as director of information technology for the State Attorney's Office. A spokeswoman for Fourth Judicial Circuit State Attorney Angela Corey said Kruidbos was no longer an employee of the office. Zimmerman, a former neighborhood watch volunteer in Sanford, is on trial in the shooting death of 17-year-old Trayvon Martin last year. Kruidbos testified before Zimmerman's trial began that Martin's cell phone contained images of Martin blowing smoke, images of marijuana and deleted text messages regarding a transaction for a firearm and that those images had not been given to Zimmerman's defense team. He received the termination letter, dated July 11, on Friday, the same day jurors began deliberating Zimmerman's case. The letter states: "It has come to our attention that you violated numerous State Attorney's Office (SAO) policies and procedures and have engaged in deliberate misconduct that is especially egregious in light of your position." Kruidbos said that, when he printed a 900-page Florida Department of Law Enforcement report from Martin's cell phone in late 2012 or early 2013, he noticed information was missing. Concerned that attorneys did not have all the information they needed to prepare the case, he said, he reported his concerns to a State Attorney's Office investigator and later to prosecutor Bernie de la Rionda. Kruidbos said he generated a report that was more than three times the size of the one that had been handed over. For example, Kruidbos said that 2,958 photos were in the report given to the defense but that his report contained 4,275 photos. Kruidbos also said that he has been told to not put specific case-identifying information into internal e-mails. Through his attorney, Wesley White, Kruidbos informed Zimmerman's defense team that the information existed. Did investigators blow the Zimmerman case? In court, Kruidbos testified that he was concerned that he could be held liable if all information wasn't shared. "All the information is important in the process to ensure it's a fair trial," he said. In a six-page dismissal letter, the State Attorney's Office, Fourth Judicial Circuit, blasted Kruidbos' assertions and motivations. Managing Director Cheryl R. Peek accused Kruidbos of having erased data from a laptop in violation of the Public Records Law and derided his concern about being held liable as "feigned and spurious" and "nothing more than shameful manipulation in a shallow, but obvious, attempt to cloak yourself in the protection of the whistleblower law." She concluded, "Because of your deliberate, willful and unscrupulous actions, you can never again be trusted to step foot in this office. Your have left us with no choice but to terminate your employment." But the defense said Kruidbos' testimony supports its claim that the state violated the rules of discovery. "When it takes me six months to get a color picture of my client, when the first one I get is a black and white, when I look at it and go, 'This is off a cell phone; cell phones don't take black-and-white pictures,' and I ask for a color copy, that takes two months," defense lawyer Mark O'Mara said Wednesday in an interview with CNN's Martin Savidge. "And then I get a pastel-colored color copy of it, and it takes me to file a motion and have a hearing set before I get the actual .jpeg, no, that's frustrating. That should not happen. I've done this too long to make believe in my own mind that that's happenstance." O'Mara said he learned about the missing information months after he was to have received it. "The only way that we really found out about it … and the only way that we really found out about the intensity of the failure to give us information was when a person from their own office, a whistle-blower, came forward and said, 'I gave them that information in the middle to end of January' and we didn't get it until June 4th." He said he was "beyond" shocked. "It could have derailed the trial," he said. The defense said it did not get the complete report until a few days before the trial. O'Mara and co-counsel Don West argued that they needed more time to go through the information found on Martin's phone and asked for a delay, which was denied. Judge Debra Nelson said before the trial that the possibility of sanctions — requested by the defense — would be addressed after the verdict. The defense team declined to comment Saturday.